I stumbled upon Rookie’s website about a year ago, just as it was getting started. An online magazine dedicated to giving teenage girls a little more to work with than beauty tips and exercise routines, Rookie promised to be “a magazine for teenage girls that respected its readers’ intelligence.” I remember thinking it was an intriguing project and wishing I were a few years younger so I could better enjoy it (or at least feel less guilty about doing so). I had completely missed the point. Sure, it can get annoying having my Tumblr dash flooded with post after reblogged post about the Rookie crowns people have made (one of the magazine’s signature styles and the product of one of its more popular DIY features). Not to mention that the cutesy aesthetic—plenty of glitter, floral patterns, and anything found in The Virgin Suicides—sometimes grates on my nerves. Yet even given the sometimes childish, cloying designs, Rookie is more than the sum of its eclectic parts, and Tavi Gevinson, the magazine’s child prodigy of an editor, is after something bigger. There are a lot of things Rookie does well. The very best thing it does is show teenage girls (and all its readers, really) that it’s fine to be feminine, that it does not exclude you from being a feminist, and most importantly, that it does not exclude you from being a person that is taken seriously. This single solid point is what makes Rookie so notable and so novel, and the release of Rookie Yearbook One is a big step in the magazine’s impact. 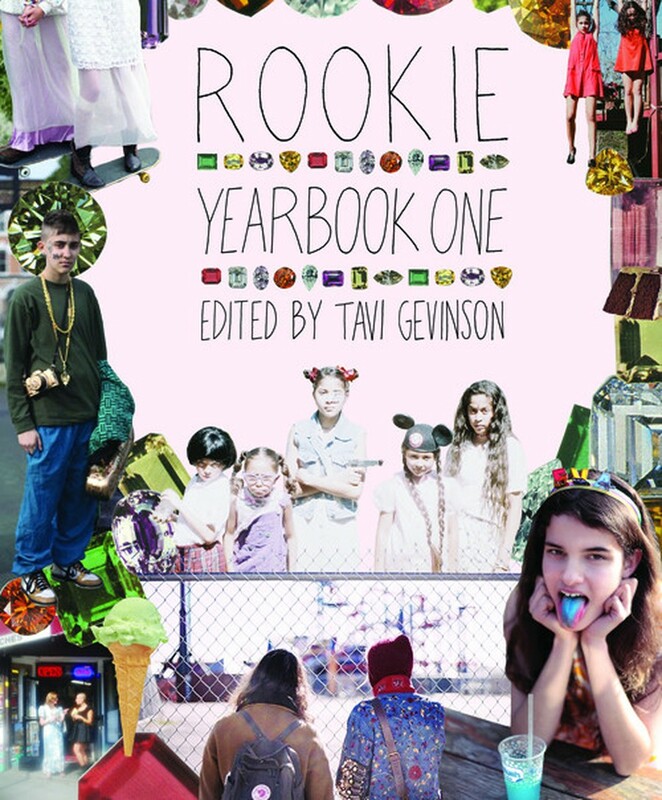 The September release of the Rookie Yearbook marks the magazine’s one-year anniversary, and its staff has pulled out all the stops. A huge, colorful book of illustrations and designs, the Yearbook is a collection of the best features, interviews, and photoshoots from the past year, supplemented with stickers, a 7-inch flexidisc, and other ephemera. Arranged by month, the themed spreads contain everything from doodled heart decorations and cut-out tiaras to interviews with directors John Waters and Joss Whedon, articles about deep-sea creatures, and photo spreads of pastel proms. There are probably a few good reasons the Yearbook was made, not least of which is that it’s a good way to snare new readers and catch you up on all the great stuff all the cool girls have been reading and you’ve been missing out on. Well, that tactic kinda worked on me. I didn’t realize I was a Rookie fan until I actually held the 352-page behemoth in my hands. The wide range of content Rookie puts out is made even more apparent by transferring its web presence into print, where seemingly disparate elements are constantly rubbing elbows. Even though the Yearbook contains a fraction of the content Rookie published this past year (the site posts new content three times a day, five days a week), the single book serves as a veritable bible to those it interests, the most comprehensive girl guide created of late. Weaving through this plethora of content is the usual feminist and body-affirming fare; there are articles on the best late night junk food to consume (“best” being the most delicious, not necessarily the most healthy), tips on masturbation, and, my personal favorite, how to bitchface (it’s harder than it looks). While these inclusions are incredibly necessary, the sort of feminism employed by Tavi & Co. tends to skew in certain directions. Given Tavi’s background in fashion blogging, much of the empowerment in the Yearbook happens through fashion (especially telling is her article “How to Not Care What Other People Think of You,” which is divided into three components: “wearing what you want,” “liking your body/face,” and “liking your brain/personality/soul/that stuff”). Given this variety, it seems hard to believe that there could be some critical things missing. Unfortunately, this is the case. A very particular aesthetic dominates the project, snaring in the same type of reader: someone who likes foreign films, sassy dresses, and uses Instagram all the time. While I love it for what it does, I wish there could be more room for other aesthetics, other tastes, and other people. What if I don’t like vintage stores, having séances, or wearing Halloween costumes to school? Am I still the reader Rookie wants, the reader that’s still deserving of smart, empowering content? The Yearbook seems a little unsure. Whether or not you can really enjoy Rookie’s particular brand of cutesy girl power, its ultimate aim (to provide teen girls with a smart, feminist counterpoint to teen mags like Seventeen and Teen Vogue) is pretty hard to argue with. This conversation pertains to all of us, and the very existence of Rookie should be fascinating to everyone. It’s only one step and one development, but it’s a necessary, if imperfect, one. I only hope that its existence can lead to other projects, that one day it won’t be the only place to go for an interview with David Sedaris, tips on how to make a zine, and other content that makes teenage girls feel like a little more than walking Barbie dolls.